Hydroponic systems are getting popular in the last few years due to more efficient growing that doesn’t take as much effort as when using soil. One of the major reasons why people convert to hydroponic plant growing is because you can change the nutrients and amount of those nutrients in the water. This allows you to entirely control the plants and remove the deficiency, but this can happen as long as you use the proper nutrient supplements. 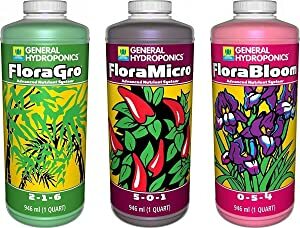 This hydroponic nutrient set comes with a pack of three bottles called the Flora Series. This is basically the starter pack which every home-grower will need once he gets his hydroponic system. Depending on the plants you grow, you can also customize the mixture of nutrients in order to let your plants grow as efficiently as possible. Floramicro is one of the bottles that you get with this pack, it is a mixture of calcium, nitrogen, and potassium. FloraGro specializes in building the root structure and helping the plant during its vegetative stage. 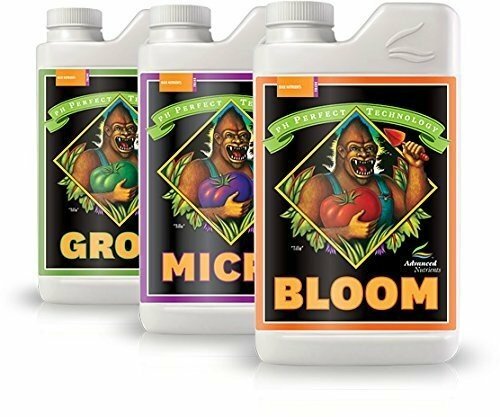 The last bottle is FloraBloom, which helps vegetables with growing in a larger size and weight than usual while keeping the flowers big and colorful as well. The package varies in different container sizes, ranging from a pint and quart to a gallon and even 55-gallon drum. 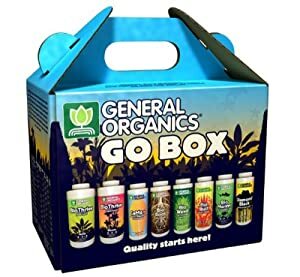 This is another hydroponic nutrient package from General Hydroponics, they made a Go Box package which comes with various organic nutrient filled bottles that can sustain almost all plants. With the package, you’re getting instructions and a schedule that shows you how much you should use for each bottle and when. The Go Box comes with pint bottles of BioThrive Grow and Bloom and 8-ounce packages of CaMg+, BioRoot, BioWeed, BioBud, BioMarine, and Diamond Black. Each bottle is specialized for different plants, so read the manual and be careful which one you’re using and how much. For an example, if you’re growing tomatoes you will need a lot of calcium in order to prevent diseases like blossom end rot. The CaMg+ package will help you with preventing this disease. Now enough with General Hydroponics, they are a great and reputable brand in the business, but there are other equally good companies out there as well. Here we have a three-bottle package from Fox farm, which comes with three quart-sized bottles that offer you almost everything that you need. The bottles are called Grow Big. Tiger Bloom, and Big Bloom. A lot of users tend to buy this package because it is effective for growing medical cannabis, but you can use it for other plants as well. We recommend you to start off with the Grow Big bottle because it helps with leaf and vegetation growth. Once you have finished that stage, you can move onto the Tiger Bloom package. You can also use Big Bloom during the entire growing process because it is used to improve the plant’s yield. Note that Fox Farm recommends that you leach your system every two weeks when using these supplements in order to keep your crops healthy. 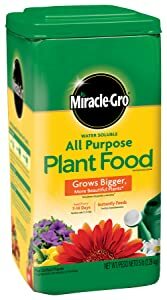 Miracle-Gro all-purpose plant food is a great side supplement that can be used with other nutrients as well. The company says that their formula is safe to use on all kinds of flowers, shrubs, trees, and vegetables. This comes in a 5-pound package that only needs to be used every one or two weeks. It comes with a manual as well and as long as you apply It correctly, your leaves won’t burn out. 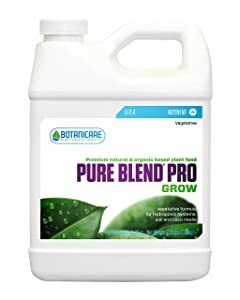 This isn’t the ideal nutrient product because it doesn’t add a lot of nutrients for your plants, but if you combine it with other products then you’ll get the ideal product. 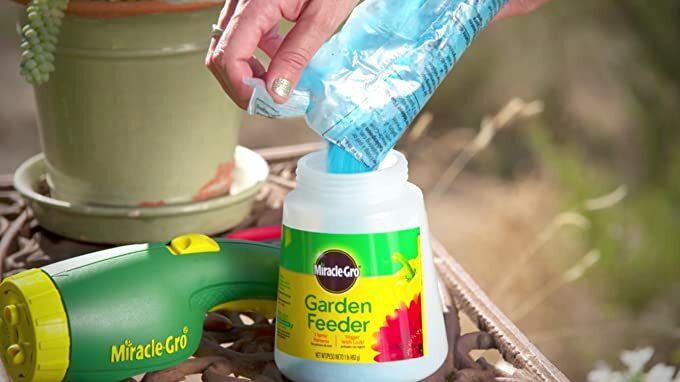 Also note that you shouldn’t use too much of this product, follow the amounts recommended by the Miracle-Gro company for the best results. Now we’re moving onto a pint-sized product that comes from Humboldt’s Secret. This hydroponic nutrient model can make up to 250 gallons of a nutrient solution when mixed with water. It is a great product because it shortens the vegetation stage and helps the plant grow faster in order to increase your harvest. When using this solution, you should add 2 ml or less of this nutrient to each gallon of water in your hydroponic system reservoir, you should also mix in your base nutrients. Take good care of the pH levels, the mixture should be between 5.5 and 6.5 in order to help your plants absorb as much as possible. The company also makes Base A and Base B essential nutrients that can be used with the golden tree model. Keeping pH levels balanced is one of the most important things that you should take care of when growing plants, especially when using hydroponic systems. Thankfully, with this from Advanced Nutrients, you can automatically keep pH levels balanced by using their supplements. Of course, you should still check the pH levels every once in a while. You can also use this supplement in combination with their other products in order to improve the growth process. 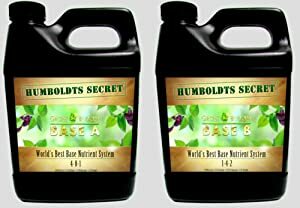 The package comes with three bottles that provide you the basic necessary nutrients needed for your plants to grow, but besides the basics, these supplements also contain formulas that provide you amino acids and fulvic acid. Fulvic acid is commonly found in humus, it is great because it contains a lot of nutrients that help your plants grow. Follow the instructions provided in the package in order to use this supplement efficiently. Medusa’s Magic nutrient supplement contains one of the most basic nutrients needed for your plans, it contains iron plus organic acids, calcium and it has a 2-5-2 formula. You can buy this product in a 1-quart package, 2.5 gallons, 5 gallons and 1-gallon packages. It contains both micro and macro nutrients that are essential during both the growing stage and vegetation stage. You can use it as a standalone nutrient, but we recommend you to combine it with other hydroponic nutrients as well. It contains various ingredients like humus and organic acids, it is also high in calcium with 6% of it. This model also contains a lot of iron which may add a darker green color to your plants. The company that makes it comes from Oregon and they make their nutrient brews in an eco-friendly way without wasting anything. This nutrient mix for hydroponic systems comes in both 2-3-4 and 2-3-5 formulas.Using this mix is easy but it is still targeted towards more advanced users. The packages come in 1-gallon, 2.5 gallons, 5-gallon and one-quart options. The mix uses a custom blend of both natural and organic sources that come with essential major, secondary and trace minerals. With this supplement, you can grow lush green vegetation with high-quality fruits, vegetables, and flowers. The mix provides you increased nutritional values and it is a healthy alternative compared to other hydroponic nutrients models. Note that you should just use this supplement once a week, using it more than that may damage or even destroy your plants. 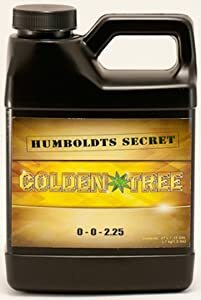 We have already reviewed Humboldts Secret Golden Tree model, but they have another great supplement called Secret Base which comes with the A and B model. It is a highly popular hydroponic nutrient and we can say that it is the product which skyrocketed Humboldts Secret into popularity. You can use this mix on almost all plants, trees and shrubs. It comes with a 2-part base nutrient system that provides essential ingredients for all that is green to grow healthy and reach its full potential. This model comes with two bottles which come in a 32-ounce model, a 1-gallon one and a 2.5-gallon version. This works best as a standalone nutrient supplement and we don’t really recommend you to mix this with other models. The base A jug comes with 4% nitrogen solution and the Base B model comes with 1% nitrogen solution. Coming from Blue Gold, we have an amazing hydroponic nutrient package. The company claims that it helps with improving root growth which will in return create colorful and vibrant foliage. With more root growth, your plants will absorb more nutrients and they will harvest faster with an increased quality. You can use this mix with all garden plants and it is compatible with most if not all hydroponic systems. It contains more than 85 herbs, 90 minerals, 35 seaweed plants and oceanic clays, and 21 plant oils and extracts. 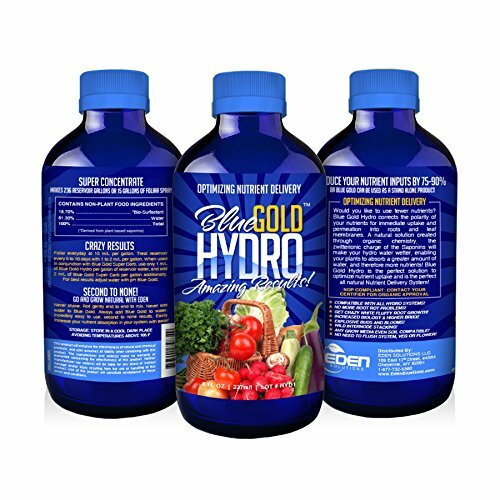 Blue Gold also claims that you can improve the taste and production with the help of their natural formula. With a single bottle, you can make up to 47 gallons. It is also helpful when it comes to eliminating various diseases like root rot and it can remove toxic fungicide and insecticides. Carefully use this supplement and don’t mix it with other products. We have already established that the use of nutrients for hydroponic systems is not only beneficial but essential as well. Using these nutrients can be either complex or as simple as setting up your hydroponic system. If you’re a beginner who isn’t sure which models are good for you, then either check our reviews list or stick with a reputable formula that works with most people. Before you head on and start experimenting, just stick with one kind and follow their instructions in detail. An issue with most nutrients is that some of them are quite expensive, we saw that some models tend to cost about $0.30 per gallon of nutrient solution. But you don’t need to spend all your money on the most expensive models, you can buy models that are as efficient as the premium ones. Sometimes these nutrients bottles can cost you just 2 cents per a gallon of nutrient solution, but be sure that it isn’t just barebones and that it is worth your time. Since nutrients are an essential part of your new hydroponic system, you need to make sure that it is easily absorbable by your plants. Since there is not soil and you have water instead, you will need to make sure that the nutrient solution is soluble in water, because if it isn’t, then your plants can’t take it. Since you’re using water, you as a grower will have absolute control over which nutrients reach your plants and in what concentration they do. This allows you to customize your water according to the needs of your plants. If you have a nutrient meter by your side, you can also monitor the number of nutrients currently available in your water as well as their consistency and concentration. 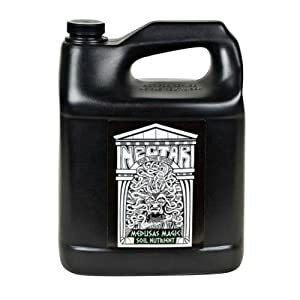 Since there are more than 20 types of basic nutrients needed for a plant to grow, you will need to ensure that all of them are available for your plants. It’s even better if you can add some extra nutrients that can make your plants grow faster. A good nutrient model will also offer you mineral nutrients which are mostly available in most nutrient solutions. Some of these models are Nitrogen, Potassium, Phosphorus, Calcium, Magnesium, Sulphur, Iron, and others. It is not essential for you to have all of the mineral elements, but it is a great plus if you do. Since plants grow in stages, the best thing you can do is order models that come with a package of multiple bottles. 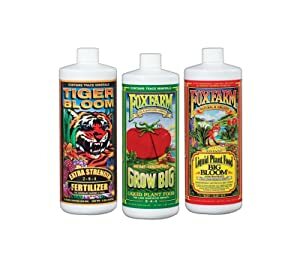 These bottles are usually very different compared to each other and each one specializes in some stage that boosts your plant’s growth. There are a lot of reports about using nutrients in hydroponic systems, most of these myths are false while some of them are correct, but to jump right to the facts, there is nothing wrong or unhealthy about using hydroponic nutrients. The main reason why people are afraid of buying hydroponically grown vegetables is that they might taste different. This is most commonly said because people tend to talk about the industrially grown vegetables that are grown in hydroponic systems. This is false mostly because you, as a minor grower, will not affect the vegetables in a way that will artificially make them look better or last longer. If you were to grow tomatoes in your garden filled with soil and in a hydroponic system, you would notice no difference in taste. Sometimes it is even better to use hydroponic systems because you can add nutrients that make the taste even better. Another question that many starters ask is whether it is possible to make your own nutrient solutions. Most of the times, making stuff yourself is a lot better than if you buy it in your local market or order it online. Of course, this is the same case when it comes to nutrient solutions, but be aware that if you’re a beginner you won’t have an easy time making it. Even professionals have trouble because of how complicated it is. Nitrogen is one of the essential nutrients in your supplements, but it is also one of the hardest things to add in a mix. But in order to use nitrogen, you will need to buy or create a nitrate solution, which is also hard. You can get nitrogen from various sources like grass and urea, but it isn’t simple to extract it. Mixing your mowed grass with water will do nothing. You can always find a company that makes bottled solutions. Getting any sort of certified organic nutrient is easy and they come with various manuals that explain to you how to mix it with water and in how many doses. In the end, we have to remind you again that this is no easy job, sometimes it is just much simpler to buy a commercial nutrient package. Note that you should use the proper nutrients during each growth stage. Nitrogen will be used a lot when the plants are in their vegetative phase of growth, in order to grow they will need huge amounts of this nutrient. Later on, when your plants start to mature, you should reduce the amount of nitrogen and they will need nutrients like phosphorus, potassium, calcium, and magnesium in order to properly grow. Just like in any field, when first starting out a beginner will usually miss out on a lot of do’s and don’ts. In order to make things a lot easier for you, we have gathered up some of the most important cautions that you will need. First, you should always keep the temperature in check. By keeping track of the temperature, you will make sure that your plants can absorb the solution as efficiently as possible. Both the mix and the water should be between 68 and 72 degrees Fahrenheit. It will get troublesome if your temperatures are too high. You will encounter various issues such as algae, which will rapidly start growing in your system’s reservoir. But if your temperatures are too low, the plants won’t survive for too long and their health will decrease every time they are fed. Another important thing is that you put your lids to use, these lids for your system’s buckets usually come in almost all models. By placing lids on your hydroponic system’s buckets, you will make sure that no parasites, diseases or even algae will manifest. Keep track of how hard your water is as well, for effective and real results, you should check the water’s hardness in ppm. By controlling your ppm and keeping it in balance, you will control both acidity and alkalinity. Try not to use tap water because it will contain a lot of chlorine. But if you’re forced to use tap water, then leave it at room temperatures for at least 24 hours in order to at least minimize the amount of chlorine. This way you will ensure that your plants grow properly. The last thing you should do is use hydroponic systems made not out of metal, but out of plastic. If your system is made out of metal, then depending on the kind of it, it may interact with your nutrient solution in a way that it will lower the solution’s effectiveness. If you can’t use plastic, then just make sure that the material used is BPA-free and food-grade safe.